Today is the feast day of Neoplatonic philosopher and Christian theologian Boethius (Anicius Manlius Severinus Boethius), author of The Consolation of Philosophy, and according to tradition martyred in 524 or 525, or possibly 526, by the Ostrogothic king Theodoric. We know roughly as much about why Boethius was killed as when or how. We do know that he came from a line of prominent Romans (including a couple of popes back there, depending on who you count as “pope”), was himself consul in 510, and his sons were rather astonishingly joint consuls in 522. At that time he moved up to Ravenna accepting an appointment at Theodoric’s court as the Master of Offices, something like the equivalent of chief of staff, managing the work of Theodoric’s officers. But then things went horribly wrong. There is a long tradition, going back at least to the eighth century, regarding Boethius as having been executed for maintaining the Catholic faith against the Arian Theodoric. 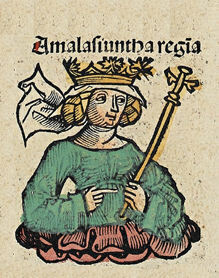 While Theodoric was probably paranoid about spies representing the Catholic eastern emperor-in-waiting Justinian (who would, in fact, later “reconquer” the Italian peninsula), and Boethius claims in the Consolation that he was hated for being smarter than everyone else, the truth is probably that he was caught up in the usual machinations of an imperial court. A member of the Senate was accused of treasonably conspiring with Justinian’s predecessor Justin I against Theodoric. 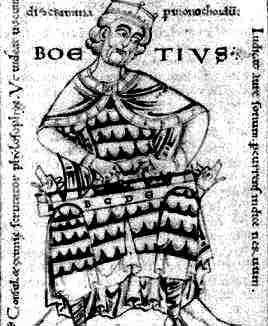 Boethius defended the accused (apparently the only person to do so, although the charges were surely trumped up), and in the Consolation, Boethius says he was only defending the Senate (implying that the accusations were meant to undermine the authority of the Senate by challenging its loyalty to the king). In any event, the sources we have say that Boethius was condemned by the Senate (who appear to have thrown him under the bus) without being able to speak in his own defense. After an indeterminate time of imprisonment, he was executed. It was while he awaited death that he wrote his most famous and arguably most influential work, The Consolation of Philosophy. A few of the many editions of The Consolation of Philosophy available. Others are available free at Project Gutenberg (here, here and a Latin one here), as is a podcast version. Boethius’ translations of and commentaries on ancient Greek philosophy were the only such texts available in Europe for much of the Middle Ages, but the Consolation was translated and widely read even outside of the philosophical circles in which his other work was so important. Written in the form of Menippean satire (alternating verse and prose) as a dialog between Boethius and Philosophy, the Consolation is Boethius’s attempt to think through and make sense of the sad state of his affairs. 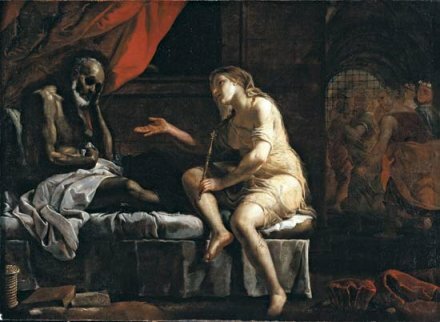 Boethius and Philosophy, by Mattia Preti. Ultimately, it was both the universal nature of the problem (why are these horrible things happening to me?) and the compelling way in which he tackled the problem (a combination of Plato, Aristotle, and Stoicism) that have made this text so widely read and imitated. There is no way in this space to do justice to the Consolation, which addresses the very idea of philosophical discourse (“would you like us to clash together our arguments, for perhaps out of a conflict of this kind some beautiful spark of truth my fly out?”), the nature of time and God’s perspective outside of time, the difference between providence and fate, and the nature of and way to the Good itself. But since goodness confers on each man his reward, he will only lack it when he has ceased to be good. [ . . . Now] since the good itself is happiness, it is clear that all good men are made happy for this reason, that they are good. But those that are happy, it is agreed, are gods; and therefore that is the reward of good men, which no time can lessen, no man’s power diminish, no man’s wickedness obscure, to become gods. These things being so for good men, no wise man can doubt either of the punishment inseparable from evil men; for since good and evil, and also punishment and reward, are directly opposite to one another, what we see added in the case of the good man’s reward must necessarily be reflected in an opposite manner in the evil man’s punishment. As therefore goodness itself is the reward for good men, so for wicked men wickedness is itself the punishment.